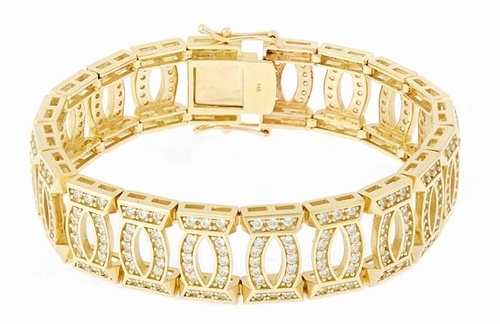 Our Francais Pave Set Round Cubic Zirconia Bracelet will compliment the look of the refined individual. Over half an inch wide and over 300 meticulously placed pave set round high quality cubic zirconia gems in a double C motif will accentuate your wrist. The total weight includes approximately 10 carats of the finest hand cut and hand polished original Russian formula cubic zirconia. Choose from 14k white gold, 14k yellow gold or luxurious platinum. 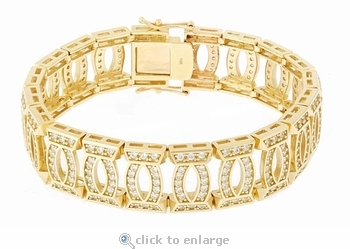 This bracelet comes standard in a 7 inch length. An upgrade to 8 inches is available, please see the pull down menu for options. For further assistance, please contact us directly at 1-866-942-6663 or visit us via live chat and speak with a knowledgeable representative. A matching ring is also offered. Please see item R1070 for details.